Home » Module 1: Gender Matters » Content » How is Alcohol Absorbed into the Body? Where Does Alcohol Go in the Body? How is Alcohol Eliminated from the Body? Note: The term “alcohol” will be used to mean ethanol unless otherwise noted. When alcohol is consumed, it enters the stomach, where it can be absorbed into the bloodstream. However, if no food is present, most of the alcohol moves down into the small intestine where there is a much larger surface area for absorption compared to the stomach. The cells that line the stomach and small intestine (part of the gastrointestinal or GI tract) are called epithelial cells. These cells are perfect for absorption because they have finger-like projections protruding into the GI lumen, which tremendously increases the surface area for absorption of nutrients and other molecules through the membranes. If one drinks alcohol with food in the stomach, the pyloric sphincter separating the stomach from the small intestine closes to allow the food to be digested by stomach acid. Since the alcohol can’t move into the small intestine immediately, this slows the absorption of alcohol into the bloodstream considerably. In fact, a fatty meal can reduce the peak blood alcohol concentration (BAC) up to 50% relative to that produced when alcohol is consumed on an empty stomach. Most alcohol absorption into the body happens in the small intestine. The presence of fatty food can significantly slow the absorption of alcohol into the bloodstream. To be absorbed, alcohol moves across the epithelial cells, through the interstitial space, and into the capillaries. The capillaries are made of endothelial cells. As alcohol moves through each of these cells, it moves in the direction of the concentration gradient. Figure 1.3 Absorption of ethanol from the gut into the bloodstream. 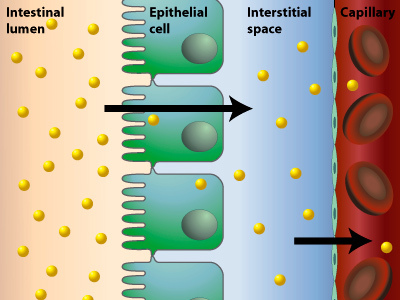 Ethanol molecules in the gut diffuse across epithelial cells, through the interstitial space, and then into nearby capillaries. Figure 1.4 Ethanol moves across membranes in the direction of the concentration gradient. When alcohol is absorbed into the bloodstream it crosses two kinds of cells—epithelial cells lining the gut, and endothelial cells that form the capillaries. Let’s look at how alcohol moves into the bloodstream in a little more detail. The movement of alcohol across cell membranes is possible because of its chemical character and the biophysical properties of the membrane. The cell membrane is a lipid bilayer—it contains phospholipids, small molecules that have a polar phosphate head (hydrophilic or water loving) and a nonpolar lipid tail (hydrophobic or water fearing) (Figure 1.5). Two layers or sheets of phospholipids are stacked together with their lipid tails touching to form a hydrophobic core. The polar phosphate heads face the water-filled exterior or interior of the cell. The membranes also have large proteins that are embedded within the lipid bilayer. The proteins often form pores through which water and small, dissolved molecules or solutes can move (Figure 1.5). Ethanol is small (its molecular weight is 46 g/mole or 46 Daltons) and polar, so it has no trouble crossing these cell membranes. Figure 1.5 – The biological membrane is a lipid bilayer. The lipid bilayer contains proteins that span the membrane, creating spaces and pores through which water and small solutes can pass. Learn more about the structure of biomembranes. The biological membrane structure allows small, uncharged molecules like ethanol, CO2 and H2O to pass directly through the membrane by the process of diffusion. Ethanol can move through the water channels or pores that are created by proteins embedded in the cell membrane (Figure 1.5a). This form of diffusion is called filtration because ethanol is small enough to “filter” through the pores. Ethanol can also diffuse through the core of the lipid bilayer, this is because it is also slightly lipophilic (lipid loving) and relatively small. Other kinds of polar compounds are charged, which prevents them from diffusing through the hydrophobic core of the membrane (they can only dissolve in water). The filtration and the diffusion of ethanol across the membrane are forms of passive transport because no cellular energy is required. The concentration gradient is the driving force that moves the ethanol molecules through the membrane. Large molecules that cannot diffuse across the cell membrane can enter the cell with help from special proteins inserted in the membrane. If the movement is with the concentration gradient it is called facilitated diffusion; if it is against the concentration gradient, this requires energy, and is known as active transport. Glucose moves by active transport through cell membranes. Figure 1.6 – Ethanol diffuses passively across biological membranes. Ethanol diffuses across the biological membrane by moving through the lipid bilayer itself and by moving through water pores and spaces created by proteins. The driving force to move alcohol across a membrane by diffusion is the concentration gradient. Like all internal organs, the stomach and small intestine are wrapped in a fine network of capillaries. As alcohol crosses the interstitial space between the GI tract and the surrounding capillaries, its small size allows it to pass easily through the endothelial cell membrane wall into the capillary. From there, it is carried toward the veins that are headed toward the liver. All blood vessel walls are made of specialized flattened endothelial cells. But in the capillaries the walls are only a single cell thick to allow gas exchange between the blood and the cells nearby (Figure 1.6). It is easy for water and solutes to move through capillary membranes because the endothelial cells are loosely packed together, leaving spaces between them. Also, there are small holes in the membrane that open and close transiently. These holes are called fenestrae (from the Latin meaning “windows”). The spaces between endothelial cells and the fenestrae allow alcohol to diffuse by filtration into the blood, with the concentration gradient. Once alcohol enters the capillaries, it is carried by the bloodstream into the veins where it can then be distributed throughout the entire circulation. Figure 1.7 Capillaries contain endothelial cells that are loosely packed together. Ethanol is small enough to filter (diffuse) through these spaces.